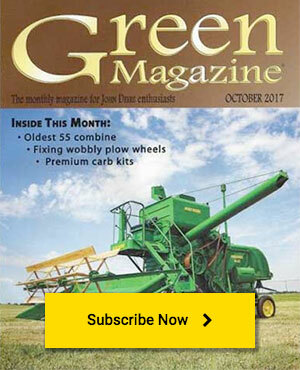 When I turned to page 25 of the John Deere 4520 tractor article in the August 2006 issue of Green Magazine, the picture of a 4520 with two model 1300 planters on a No. 16 circle hitch brought back memories of my involvement with modernizing a 10,000 hectare (25,000 acre) Hungarian corn farm in 1970. 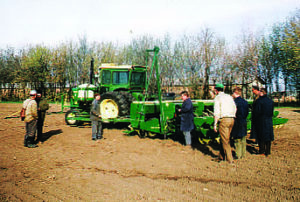 At that time, Hungary was still behind the Iron Curtain and this was one of the earliest of many projects John Deere would participate in during the coming years. It involved John Deere for the equipment, Pioneer for the seed and a chemical company for the insecticide and herbicide. The location was Babolna State Farm in northwest Hungary near the Austrian and Czechoslovakian borders (see map). For centuries, it had been the official state farm for breeding and training horses for the military and they still had some beautiful, highly trained horses for ceremonial purposes. The farm had level, well drained, productive land which would make any midwestern grain farmer drool with envy. Hungary has always been more progressive than some of its surrounding neighbors and was very receptive to American methods. The project involved eight 4520 tractors, eight No. 16 circle hitches, eight No. 23 tractor mounted boom sprayers and 16 model 1300 plateless planters with fertilizer and insecticide attachments. I asked, “Are you my interpreter?” He replied with a big smile and a string of profanity which would make a Marine drill instructor blush. As it turned out, he had been forced into the German Army during World War II. Subsequently, he was taken prisoner by the Americans and learned his English from the American GIs. Not your textbook example, but it was functional. The first order of business was to inventory everything to check for shortages and/or breakage from shipping. We had some breakage of small parts, but the shipment included several boxes of parts and hardware, so no problem I thought. The political people were insistent that I open the boxes, which seemed strange; they would have refused payment claiming damaged goods at arrival. Eventually, they had to open them. We concentrated on getting one unit operable in the field. Since we had plenty of yard space, I had the planter crew set up sort of an assembly line getting boxes opened and the contents lined up in assembly sequence. That night, I had a planter school with a movie to show them how the plateless units worked. On day three, we made it to the field with the first unit. I learned that the “top dog” was the tractor driver, so their most experienced driver, Bondi (standing by the left rear tractor wheel, below), was the operator. This was the largest equipment he had ever driven, so we spent time on turning and backing as well as operating the planter and sprayer controls. He was a fast learner, so we soon filled the boxes and started to plant. The anticipation level was high because in 1970, this was the ultimate in planting technology for people who were used to planting with two-row planters and 20 horsepower tractors. After the first pass, we had a digging session—dig across the row instead of down the row so if the seed is dislodged, you can still tell the spacing. Soon everyone was digging and as I watched, they started nodding approval. We continued to plant and by evening, the wine bottles came out and our passports and visas were “approved” and returned. Bondi learned the next day that large, heavy equipment wouldn’t go through wet spots that he was used to navigating (above). 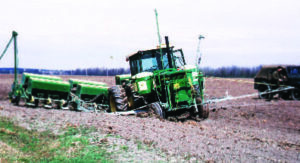 It required a crawler to free the tractor and planter, but his embarrassment subsided when I assured him that this happens to Americans, too. We had everything going pretty well by the end of April, so we made plans to leave on the first of May. In the communist world, May 1 was a day of celebration so we were invited to attend a large dinner that featured many wine toasts by the political people, mostly to each other, but everyone joined in on the wine drinking. I had the privilege of sitting with Tibor and Bondi and their families during the dinner as well as at the horse show. During the show, we were presented with whips as a memento of Babolna’s heritage as a premier horse farm (above). As we were preparing to leave early on the morning of May 1, all of the drivers and mechanics gathered near our car and one of them was obviously holding something under his coat. My first thought was, “Please, no more wine.” Then he opened his coat and displayed three whips. The whips, we were told, were from them, not the political people, so we quickly put them in our luggage to avoid any problems. My two whips are still on my office wall as a reminder of the respect I gained for these hard-working tractor drivers and mechanics.